I can't believe that I actually finished this so ahead of the deadline! I feel like I should get a prize or something... Ha ha ha! 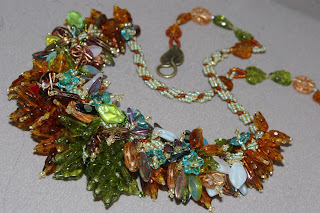 My challenge piece for the August challenge was completed and listed at two minutes to midnight before the deadline. But this piece just came together so nicely - I started it on a Sunday and finished it on a Tuesday! Amazing! I'm really getting into these embellished ropes. I love embellishment and fringe, and although I'm not a big fan of spiral rope making, I'm now finding that I can do all sorts of cool color palettes and my ideas for embellishing them are coming fast and furious.